Snack Girl is on an egg kick because eggs are just SO nutritious. And, they are an affordable source of protein when you compare them to meat. Hard Boiled Eggs are a simple way to enjoy an egg. But, they are a little dull on their own. How do you make eggs interesting? Try poaching them in a tomato sauce. It is ridiculously easy and all it takes is a bit of planning. You can make 4 or more of these at once and then just store them in your fridge for later consumption. They keep really well with plastic wrap or in plastic bags. These taste great cold, room temperature, or hot. You can shove them in your bag to take to work and heat in the microwave. The key is to find a tomato sauce you like or make your own. Be sure there isn't any added cheese to your sauce or the amount of calories in this dish will change radically. The tastiest sauces are in the refrigerated section of the store, but they tend to be much more expensive than the jarred brands. If you want to make this recipe more interesting, add some spinach, onions, green pepper, or whatever suits you. I think some chopped veggies would be a yummy addition. Finally, get your hands on some cute ramekins. These are incredibly elegant and give your snack an enticing lift above a bag of chips. Ramekins are versatile. You can use them to serve olives or pickles. If you have kids, giving them individual portions in these little bowls will motivate them to eat almost anything. Of course, a dessert that WILL NOT BE MENTIONED ON THIS SITE (creme brulee) is commonly served in these. But, you can't make that dessert without a blow torch so don't even try it! 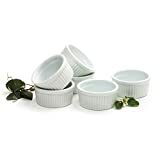 I found my ramekins at a thrift store because it seems to be one of those items that collect dust in people's cupboards. Check out the ones below from Amazon.com. Preheat oven to 350 F. Put the tomato sauce in bottom of a ramekin or an oven-proof coffee cup. Crack egg on top of sauce and top with a little grated Parmesan. 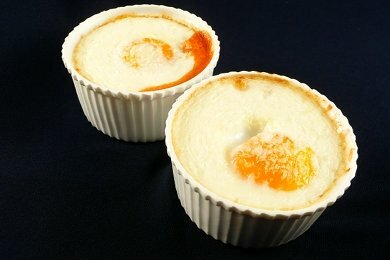 Place ramekins on baking sheet and bake for 20 minutes until the egg is cooked as much as you like it. If you like runny eggs you can take it out of the oven a few minutes earlier. Cheap Eggs - Should You Buy Them? Does anyone else get concerned when they see a tag like the one above? Ninety-seven cents for eggs?!! I have made something similar using a metal muffin tin...you just crack one egg in each muffin spot. do you need to grease/pam spray the ramekins at all? I don't even like eggs and this sounds delicious! Thanks for sharing! These are delicious, but 20 minutes is way too long. I cooked mine for 10 and the eggs were hard all the way through. Try sprinkling a few sesame seeds on top near the end, for added crunch and flavor. @Karina - no you don't because the sauce prevents the egg from sticking. @Louise - you are probably right - I will check mine earlier to see if they are done. Thanks so much! Oh yum! The egg recipe sounds delish!! Wow. This is so creative! I usually keep it simple when it comes to eggs---either soft -boiled or hard-boiled, sliced and topped with salt/pepper and olive oil/vinegar. I found a recipe for homemade pasta sauce that you make in the slow cooker that could make this even more Clean Eating wise than the storebought sauce. I love this idea! i couldn't resist making this for my lunch today. i made 4 of a 1/4 c sauce + 1 egg in smaller single serve ramekins. sooo good! i had no parm in the house but i had laughing cow light cheese wedges. i put one on top, and stirred the whole thing together breaking it all up and melting the cheese. i just have to say it's DIVINE, and it was a great way to use up that leftover 1/2 jar of spaghetti sauce i had sitting in my fridge! thanks, sg! How long would it last in the fridge? Would they hold in the freezer? This was great, I used Vodka tomatoe sauce (contains cream, PR cheese) and 1 duck egg. Very nice flavor. @Kay - these would last one week in the fridge - and I haven't tried the freezer. It would probably work. Great question! These have become a staple in my home. I was out of marinara sauce the first time I tried it, so used a favorite salsa that I blended to smooth it out a bit. We actually prefer the recipe with salsa, but either is great. easy, yummy, and portable!